Hi there! After Europa last week, I tell you today on the next Galilean satellite, which is Ganymede. It is the largest planetary satellite in the Solar System, and it presents an interesting surface, i.e. with different terrains showing evidence of past activity. This is the opportunity for me to present you Viscous relaxation as a prerequisite for tectonic resurfacing on Ganymede: Insights from numerical models of lithospheric extension, by Michael T. Bland and William B. McKinnon. This study has recently been accepted for publication in Icarus. Ganymede is the third, by its distance to the planet, of the 4 Galilean satellites of Jupiter. It was discovered with the 3 other ones in January 1610 by Galileo Galilei. These are indeed large bodies, which means that they could host planetary activity. Io is known for its volcanoes, and Europa and Ganymede (maybe Callisto as well) are thought to harbour a global, subsurfacic ocean. The table below lists their size and orbital properties, which you can compare with the 5th satellite, Amalthea. 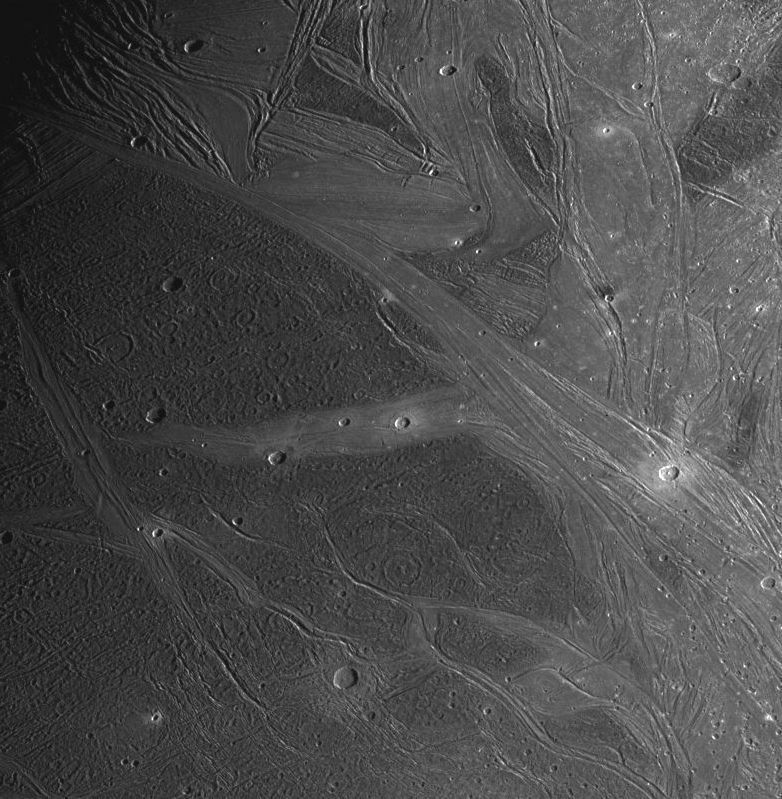 We have images of the surface of Ganymede thanks to the spacecraft Voyager 1 & 2, and Galileo. 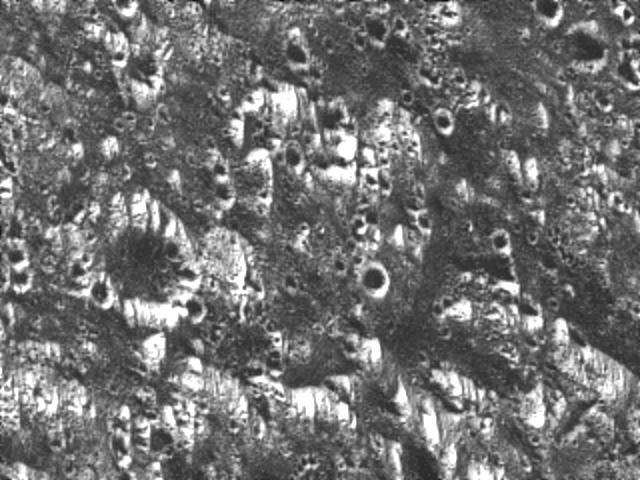 These missions have revealed different types of terrains, darker and bright, some impacted, some pretty smooth, some showing grooves… “pretty smooth” should be taken with care, since the feeling of smoothness depends on the resolution of the images, which itself depends on the distance between the spacecraft and the surface, when this specific surface element was directed to the spacecraft. A good way to date a terrain is to count the craters. It appears that the dark terrains are probably older than the bright ones, which means that a process renewed the surface. The question this paper addresses is: which one(s)? Band formation: The lithosphere, i.e. the surface, is fractured, and material from inside takes its place. This phenomenon is widely present on Europa, and probably exists on Ganymede. Viscoelastic relaxation: When the crust has some elasticity, it naturally smooths. As a consequence, craters tend to disappear. Of course, this phenomenon is a long-term process. It requires the material to be hot enough. Cryovolcanism: It is like volcanism, but with the difference that the ejected material is mainly composed of water, instead of molten rock. Part of the ejected material falls on the surface. Tectonics: Extensional of compressional deformations of the lithosphere. This is the phenomenon, which is studied here. Beside these processes, I did not mention the impacts on the surface, and the erosion, which is expected to be negligible on Ganymede. The question the authors addressed is: could tectonic resurfacing be responsible for some of the actually observed terrains on Ganymede? To answer this question, the authors used the numerical tool, more precisely the 2-D code Tekton. 2-D means that the deformations below the surface are not explicitly simulated. Tekton is a viscoelastic-plastic finite element code, which means that the surface is divided into small areas (finite elements), and their locations are simulated with respect to the time, under the influence of a deforming cause, here an extensional deformation. The authors used two kinds of data, that we would call initial conditions for numerical simulations: simulated terrains, and real ones. The simulated terrains are fictitious topographies, varying by the amplitude and frequency of deformation. The deformations are seen as waves, the wavelength being the distance between two peaks. A smooth terrain can be described by long-wavelength topography, while a rough one will have short wavelength. The real terrains are Digital Terrain Models, extracted from spacecraft data. The authors also considered different properties of the material, like the elasticity, or the cohesion. It results from the simulations that the authors can reproduce smooth terrains with grooves, starting from already smooth terrains without grooves. However, extensional tectonics alone cannot remove the craters. 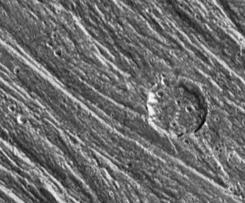 In other words, if you can identify craters at the surface of Ganymede, after millions of years of extensional tectonics you will still observe them. To make smooth terrains, you need the assistance of another process, the viscoelastic relaxation of the lithosphere being an interesting candidate. This pushed the authors to elaborate a new scenario of resurfacing of Ganymede, involving different processes. They consider that the dark terrains are actually the eldest ones, having remaining intact. However, there was indeed tectonic resurfacism of the bright terrains, which formed grooved. But the deformation of the lithosphere was accompanied by an elevation of the temperature (which is not simulated by Tekton), which itself made the terrain more elastic. This elasticity itself relaxed the craters. Anyway, you need elasticity (viscoelasticity is actually more accurate, since you have energy dissipation), and for that you need an elevation of the local temperature. This may have been assisted by heating due to internal processes. Ganymede is the main target of the ESA mission JUICE, which should orbit it 2030. We expect a big step in our knowledge of Ganymede. For this specific problem, we will have a much better resolution of the whole surface, the gravity field of the body (which is related to the interior), maybe a magnetic field, which would constrain the subsurface ocean and the depth of the crust enshrouding it, and the Love number, which indicates the deformation of the gravity field by the tidal excitation of Jupiter. This last quantity contains information on the interior, but it is related to the whole body, not specifically to the structure. I doubt that we would have an accurate knowledge of the viscoelasticity of the crust. Moreover, the material properties which created the current terrains may be not the current ones; in particular the temperature of Ganymede is likely to have varied over the ages. We know for example that this temperature is partly due to the decay of radiogenic elements shortly after the formation of the satellite. During this heating, the satellite stratifies, which alters the tidal response to the gravitational excitation of Jupiter, and which itself heats the satellite. This tidal response is also affected by the obliquity of Ganymede, by its eccentricity, which is now damped… So, the temperature is neither constant, nor homogeneous. There will still be room for theoretical studies and new models. and the one of William B. McKinnon.